Today’s photo is nothing great in the context of photography, but it is something great in my life and the 3 others in the photo. 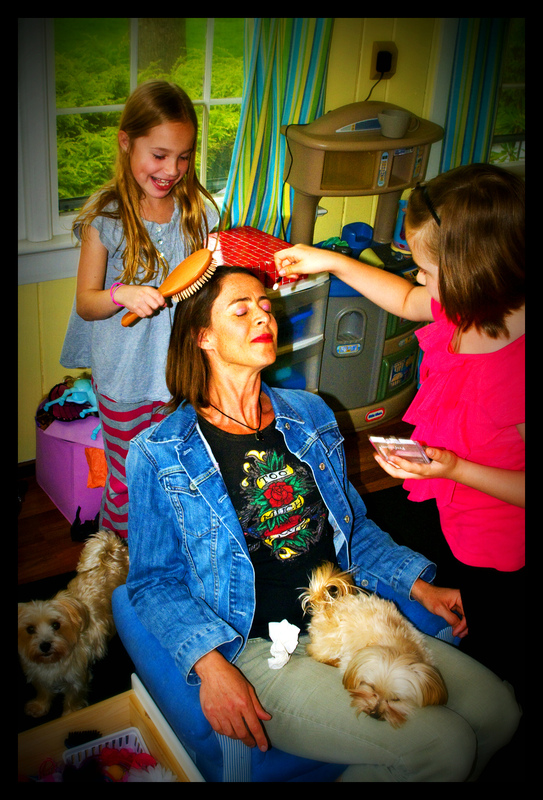 My wife Sharon in the chair, daughter Jade applying the make-up and her friend Ava doing the hair. It was a rainy, lazy type of day, but the girls were having a blast and decided they owned an imaginery Salon. Sharon was the first customer and off she went. There must have been good energy in the room because even our dogs, Angel and Biscuit joined in. I went to have a peek at what was going on and I could feel it. I could feel their joy and I suddenly woke up from my lazy, sleepy attitude. They were creating special memories and having fun and me just peeking in felt it and I instantaneously felt good. For a few seconds my spirit was raised and I was so happy because they were happy. It may seem so simple and trivial, but there are so many of these little moments happeneing around us everyday and quite often children are creating them, but we miss witnessing them, because we are too busy doing something else – even if that is lying down on the sofa. So I was lucky to witness this, as this was the best feeling I had all day. Thank you girls. That picture can talk! You really capture a story in that photo! We are all so blessed to see this through your eyes. Your daughter will always remember this. Oooh! A real ‘girly day’! Love the brightness of the colours… happiness is! Definitely something that most people can relate to. It is so awesome to watch.